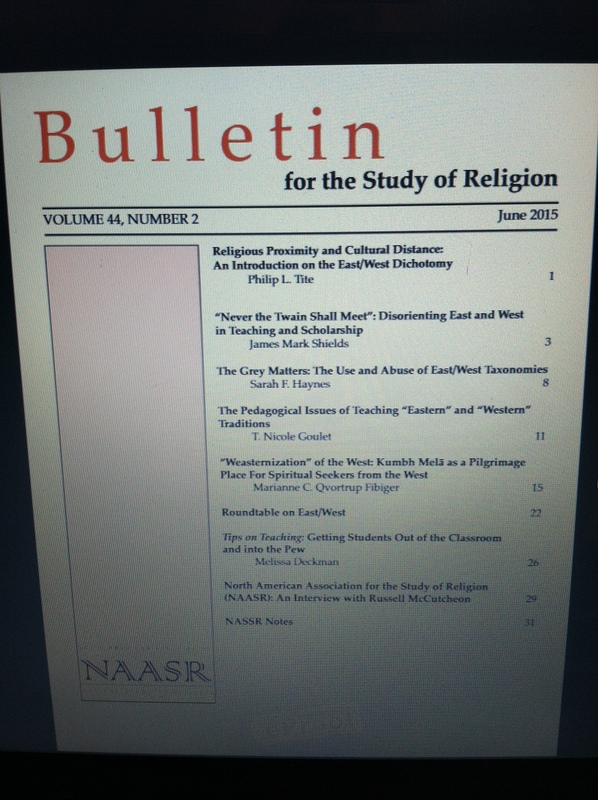 The following is the editorial introduction to the June 2015 issue of the Bulletin for the Study of Religion (the full table of contents having already been posted). We offer this editorial here on the blog in order to give readers an overview of the most recent issue of the Bulletin. A few years ago I was asked to teach the Western religions course for our summer session. This is a required course for all majors, its twin being the course on Eastern religions. Typically, such introductory courses are designed to offer basic information on a tradition’s history, beliefs, sacred texts, rituals, and modern challenges. This is where the reification of “religion” is firmly established for students. Most of us who have gone through the gauntlet of the discipline have studied in programs designed around such an East/West division and many of us find ourselves having to teach within such a paradigm. Although several have raised challenges about the “world religions paradigm” (see the discussions in Owen 2011 and Tite 2013), rarely are students introduced to those processes by which such East/West divisions are constructed and rendered normative or obvious. In my version of this course, we focused less on the Western traditions and more on the discursive construction of “Western religions” as a category. In my theories course, the historical construction of the East and the West, as mutually dependent concepts, arises with far more clarity. The East/West is the product of colonial expansion, where understanding is interwoven within the maintenance of power relations. As I mention in class, all categorization is an act of establishing, reinforcing, or challenging power relations. No categorization is benign. To categorize is to create a center and a fringe, to discursively locate social actors to the benefit of some and the disadvantage of others. Geographic categorization is an effective tool for such rhetorical moves, as many of us tend to see geography in a simple sense of physical locations such as in basic mapmaking. Indeed, to present students with a global map of the “world religions” often reinforces monolithic cultural divisions. Cultural or human geography, however, draws our attention to the contestation over spatially advocated values and meanings, be those spaces large physical geographies (such as nation states), personal geographies (such as in personal dress choices), or political geographies (ideological “camps”). As Justin Tse insightfully observes, such approaches to religious geographies “are grounded insofar as they inform immanent processes of cultural place-making, the negotiation of social identities, and the formation of political boundaries” (2014, 202). Conflict is a key component in such geographies; there is power distribution through contestation, as social actors take on the authority to “draw maps” and thus create peoples. Often such geographies are tied into an “us/them” dichotomy. As is widely recognized, the study of “the East” (and thus necessarily “the West”) arose within European Orientalism. Orientalist research (and teaching) create links between some people (“proximity”) while reifying distance with other people. Torre and Rallet (2005) have explored mechanisms of such geographic proximity/distance. Geographic relations can be established through (co-)localizations, institutional proximity (“the logic of belonging”), systems of representation (“the logic of similarity”), or some combination thereof (see also Tomlinson 2000). What Torre and Rallet offer for economic analysis nicely fits religious geographies. The dichotomy of East/West creates moments of proximity, especially between the so-called Abrahamic traditions (Hughes 2015) but also the Eastern traditions —relating diverse traditions within particular localizations. By the very act of grouping various traditions together, they are given conceptual proximity for the researcher (e.g., stereotypes of Eastern mysticism and Western monotheism, as if traditions are interchangeable due to sharing some essential “core”). The dichotomy also creates distance, rendering particular traditions “other” even while sharing physical space (e.g., the large Sikh population in Canada or the Christian population in South Korea), as if the “other” is only a “migrant faith” (thus, lacking authenticity within public discourse in, especially, “the West”). This issue of the Bulletin offers a panel of papers reassessing the construction of Eastern traditions. Originally this exchange began on our blog, and we are delighted to offer readers a more developed engagement between these scholars. James Mark Shields, Nicole Goulet, Sarah Haynes, and Marianne Fibiger engage the continued problem of “the East” within the academic study of religion. Whether they address Tibetan Buddhism’s positioning in the grey area of the East/West dichotomy, the exoticized portrayal of Taoism and Buddhism as part of neo-colonial processes, the “repackaging” of Japanese Buddhism by a Japanese modernist, or the transformation of “the Westerner” through engagement with the East, each of these articles highlights the continued impact of the East/West dichotomy not only in scholarship but also within the classroom. This exchange continues in a brief roundtable, where each author responds to their fellow panelists. This exchange functions as an invitation to the reader to enter this discussion, for the field to continue theorizing the religious geographies that continue to dominate our discipline. In addition to our panel and roundtable, we are pleased to include a pedagogical piece by Melissa Deckman for our “Tips for Teaching” section. She offers a helpful tip on using fieldwork assignments to highlight for students the intersection of the political and the religious. This issue also includes two pieces that highlight our affiliation with NAASR. Our associate editor, Matt Sheedy, interviews NAASR’s new president, Russell McCutcheon. Russ has a long history with both NAASR and the Bulletin, having served as the Bulletin’s editor in the 1990s (one of the most formative periods for the Bulletin thanks to Russ’s indefatigable efforts). This interview offers key insights into NAASR’s pivotal role in transforming the academic study of religion. We also are including a set of NAASR Notes, a recent feature on the Bulletin’s blog where several NAASR members offer us a glimpse into their scholarship. As any academic society is a composite of its members, we hope that by sharing these Notes, readers will gain further insights into the dynamic ebb and flow shaping the association. Further NAASR Notes are appearing on the blog and readers are encouraged to follow that Bulletin feature. Hughes, Aaron. 2015. “Abrahamic Religions: A Genealogy.” Bulletin for the Study of Religions 44(1): 3–11. Tite, Philip L. 2014. “Teaching Beyond the World Religions Paradigm.” Bulletin for the Study of Religion Blog. http://www.equinoxpub.com/blog/2014/08/ teaching-beyond-the-world-religions-paradigm/. Tomlinson, John. 2000. “Proximity Politics.” Information, Communication & Society 3 (3): 402–14. Torre, Andre and Alain Rallet. 2005. “Proximity and Localization.” Regional Studies 391: 47–59. Tse, Justin K. H. 2014. “Grounded Theologies: ‘Religion’ and the ‘Secular’ in Human Geography.” Progress in Human Geography 38 (2): 201–20. This entry was posted in Announcements, Editorial, James Dennis LoRusso, Matt Sheedy, NAASR Notes, Pedagogy, Philip L. Tite, Politics and Religion, Religion and Society, Religion and Theory, South Asian Studies, Southeast Asian Studies, Theory and Method, Theory in the Real World and tagged and Marianne Fibiger, Bulletin for the Study of Religion, Colonialism, East/West, Eastern religions, geography, James Mark Shields, Melissa Deckman, NAASR, Nicole Goulet, orientalism, pedagogy, politics, proximity, Religion, religious studies, Russell McCutcheon, Sarah Haynes, scholarship, Sociology of Religion, teaching, Western religions, world religions paradigm. Bookmark the permalink.